3D model surrounds and panoramics. Every standing stone is photographed from every angle. by the Negotiating Avebury Project during August/September 2002. Many photographs of the old houses of Avebury being demolished and the stones being re erected. over the last 4 years. Another unique view of the Avebury stones. a brilliant resource! Every time I dip in I find new stuff hidden away. Cd arrived fine - all I can say is wow! and thanks. It's an amazing piece of work! loads of pics per panorama) must be huge. I will play some more. What a marvelous show! From a world away, its a rare gift. Thanks, peter! Please tell me of any more updates. It's a thrill to turn on the auto spin and feel I'm there among the stones. 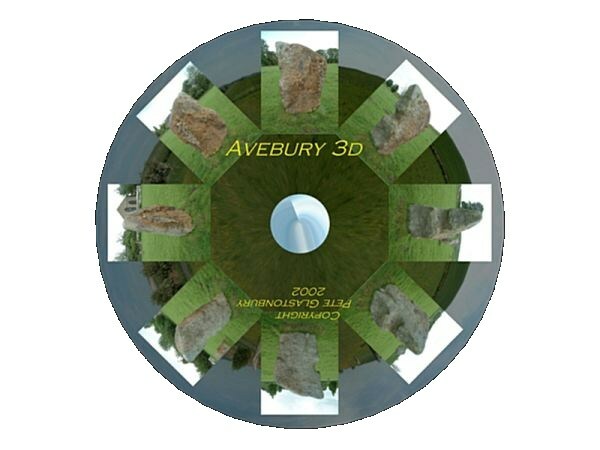 Avebury Tour has 180 astonishing 360-degree photographic panoramas. with the engravings, of Stukeleys' 1743 Abury text. A must for Avebury fans.